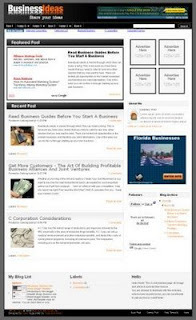 Business Ads Ready Blogger Template is suitable for business blog. You can read description and demo on Business ads Ready Intro. Keep intact credit footer link. You are allowed to distribute but not allowed to add any link. wah. . .what a nice template. . .can i use this template f0r a perz0nal bl0g? pizz. . . . g mksud menghina cuma ngejek ja mbk, 0keg jgn dmsukin k hati apalage ke d0mpet hagaha. . .
jah, kok ngeledek? hikss. itukan keluar dari hatiku yang paling dalam(hayah, lage error neh). banner atasnya kok melorot bong kl di ie? Engko nek kompieku wes sehat, tak dunlute.. wow! !mmg best..lov this templates..thanks for sharing..
ntar di cobain.... klu cocok.. tak beli... hihihi.. Script iku, nek di check, ok... bong. tapi nek wes di pasang nang third party..
@cahaya biru:waduuuh ndak tahu sayah hehehe..
do u have for wordpress ?? i has use this template, its very nice. thanks. @anonym:you mean, you want to remove three column on footer ? Thanks for quick reply Cebong. I forgot to say on my earlier post that 468x60 banner is displaying below the header. Any ideas what might be causing this? Yep thats fixed the banner problem thanks. 1. How do I get the text for featured post and recent post to show up on the black bars? 2. How do I tidy up the text in the Featured Post Box so it is justified and centred? 3. My logo is not displaying in the header. How do I add just an ordinary text title in the meantime please? 2. When you write HTML widget you can center it using justify menu. 3. leave your mail, I can't write HTML code on comment form. hello.. how do you use the feature post in blogger? mbak terus yang nulis sebelum dan sesudah readmorenya dimana?? mbak maap nih mau bertanya lagi..
koq saya tambahkan related post (artikel yang terkait) dibagian bawah ngga bisa ya? apa ada tambahan mba?solusi gitu mbak..
boleh minta script yg buat "related post" punya mbak? klo bisa kirim ke traffox@gmail.com ya mbak..
mbak cebong, how to change banner ads 125x125? Kok sy nyari di edit template nggak ada. Apa saya saja yg katrok ya??? @fiarchan: :d hehehhe baca di installation setting, sudah saya sertakan di satu folder pas download...yg file pdf..ada? yg mcm anime x buat? oh ya, ternyata ada file pdf nya mbak. Maklum nih saya donlot dari deluxe template. Soalnya pertama kali liat template ini ya disana. mbak ipiet...mau tanya ya...hmm kan klo warna link defaultnya oranye...klo saya mau ganti warna apanya ya yg diedit?? Love this template but read full story is appearing at the end of each post. How do I fix this please? my other blog, must use.. I am using this templates for my blogs www.masthmusic.com. How abt link exchange with your site what do u say..
@webmaster: up to you, I just talk about link no matter its anchor text. You can search it , "HOw to put social bookmark"
sekali lagi thank's mbak Ipiet ... dah saya pakai juga template ini. tapi gmna caranya agar follower kita ga kehapus? Very nice template..but why my Navbar cannot work..only sometime can see it working..anyone can help me? Thanks Mbak Ipiet. Great template. @ragam: ngedit nya lewat page element. Edit widget HTML di atas main post ya..
How can I change the text of the "Read full story" to my language? Wow, simply beautiful. you're theme really rocks, i like the business ad template it looks professional. thanks a lot. There is collection of Link..
Obviously awesome template for making money by blogging, thank you very much for this,.. This was very much informational and interesting blog post as i have been looking for this sort of information. thanks for sharing this wonderful information. blog is presented in a nice way!! I have been examinating out some of your stories and i can state pretty nice stuff. I will surely bookmark your blog and i will definitely share this post with my closed friends. more and more templates are released everydays, with this the world can choose anything, a complete variety of this theme, there's a template for each person in this world.